While there’s no doubt that hummus comes from the Middle East, the exact origins of this delicious chickpea and tahini dip are a little trickier to pin down. Some historical evidence points towards either Egypt or Syria as its possible birthplace, but Palestine, Jordan, and Lebanon also claim it as their own. Even the significantly younger Israel has been trying to take credit for it, and the debate has gone so far as to have a “Hummus War” erupt between Israel and Lebanon, with each side trying to create the best or biggest hummus dish. The Association of Lebanese Industrialists has even requested protected status from the European Commission to recognize hummus as a uniquely Lebanese food. Hummus has even become a point of interest in international politics, as supporters of Palestine have boycotted the hummus produced by the American company Sabra, the parent company of which has been known to donate funds to the Israeli Defence Force. The incredibly simple and oddly controversial dish also boasts high levels of iron and vitamin C, as well as folate and vitamin B6. Chickpeas are a great source of protein and dietary fibre, while tahini1, which is a paste consisting largely of sesame seeds, is an excellent source of the amino acid methionine. In addition to high levels of folate, zinc, and protein, chickpeas are low in fat, and recent studies have shown that they can help lower cholesterol. The chickpea is one of the earliest cultivated legumes and grows in the Mediterranean, the Middle East, western Asia, India, and Australia. They can be eaten raw and are featured in a number of dishes across the globe. Today’s largest producer of chickpeas is India. 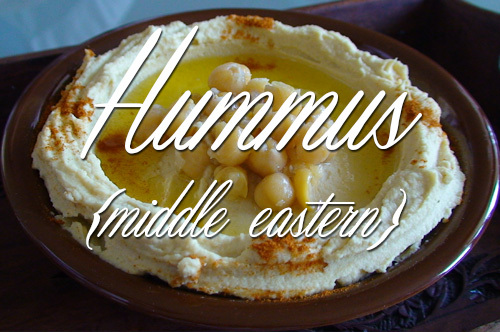 Hummus is a staple in many Middle Eastern diets and is often eaten as an appetizer with pita, as part of a meze2 or as an accompaniment to foods such as falafel or chicken. It’s incredibly diverse and is commonly garnished with tomato, cucumber, coriander, cumin, parsley, caramelized onions, sautéed mushrooms, whole chickpeas, olive oil, hard-boiled eggs, paprika, sumac, ful3, olives, pickles, and pine nuts. Olive oil, paprika or sumac, pita wedges (brushed with olive oil and sprinkled with za’atar4, or a combination of sesame seeds and sea salt), and/or carrot sticks [optional] to serve. If using dried chickpeas, put the chickpeas in a large bowl and cover them with at least twice their volume of cold water, leaving them to soak overnight. The next day, drain them, and sauté them in a medium saucepan with the baking soda (this reduces the gassy effects of fresh beans) for about three minutes. Add 3 1/4 cups water and bring it to a boil. Skim any foam that floats to the surface. They’ll need to cook for 20 to 40 minutes, sometimes even longer, depending on freshness, to become tender. When tender, one will break up easily between your thumb and forefinger. Drain the chickpeas (saving the chickpea broth for soups or to thin the hummus, if desired) and cool enough that you can pick one up without burning your fingers. Whether using fresh or canned chickpeas: Peel your chickpeas. It’s easiest to take a chickpea between your thumb and next two fingers, arranging the pointy end in towards your palm, and “pop” the naked chickpea out. Discard the skin. In a food processor, blend the chickpeas until powdery clumps form, a full minute, scraping down the sides. Add the tahini, lemon juice, garlic and salt and blend until pureed. With the machine running, drizzle in water or reserved chickpea cooking water, 1 tablespoon at a time, until you get very smooth, light and creamy mixture. Taste and adjust seasonings, adding more salt or lemon if needed. Don’t add more garlic, even if it seems like it needs it; the garlic taste becomes much more potent once it’s settled overnight. Transfer the hummus to a bowl and rest it in the fridge for at least 30 minutes, longer if you can. To serve, drizzle it with a little olive oil, and sprinkle it with paprika. Serve it with pita wedges or carrot sticks.